The Een celebration of the Winter Solstice goes by a number of names, including Auld Meryn, Auld Meryn’s Eve, or Meryn’s Eve. The name comes from an old sorceress named Meryn Moonsong who lived long ago, around the time of Leemus Longbraids. Famously, Meryn was a hermit who lived alone in a cave near the Wishing Falls. Because of this, most Eens were frightened of her. Then came the year when the Elders of Een gazed upon the heavens and predicted that the coming winter would be the darkest ever known, without so much of a glimmer from moon or star. The Eens fretted—and some even blamed Old Meryn for the coming darkness, thinking that she had cursed the skies, she loved the darkness so. The Winter Solstice arrived and, sure enough, its darkness was beyond compare. The Eens huddled in their beds, cold and fearful. Then there could be heard a clink and a clatter and when the Eens looked out their window, who should they see but Old Meryn. Her robes were patched with bright colors of red and green, and she danced upon the crust of snow, nimble as a fairy. 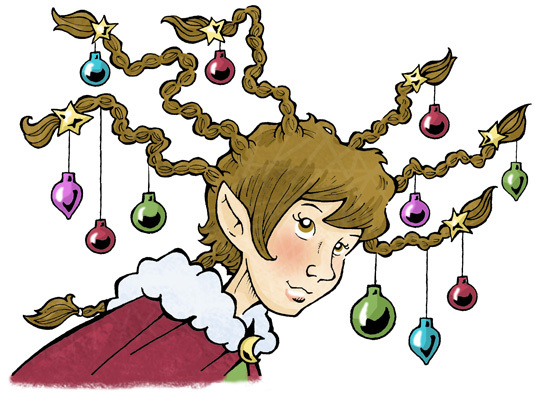 A circle of bells decorated the brim of her hat and at the end of each braid there hung some bauble or trinket, each twinkling like a winter star. And she sang in her ancient voice a spell so magical and old that afterwards some said it must have come from the elves who had once dwelled in that place. In this way, Old Meryn scattered the darkness; the brooding clouds cleared and the moon smiled upon the Land of Een. Then the Eens danced, and enjoyed a draft of Eenberry nectar. And when the Een children awoke the next morning, they found tucked in their boots small parcels of delicious treats and delightful toys. Old Meryn was never seen again. Some wondered if she had even come at all, and that perhaps the night had just played tricks on their eyes. They wondered if the presents in the Eenling boots were all just part of the prank. Ever since that night, the Eens commemorate Meryn Moonsong on the Winter Solstice. They feast, dance, and costume their braids, tails, or wings with ornaments. And the children will awaken the next morning to find their boots stuffed with treats—but whether it is their parents or the spirit of Old Meryn, none can say.